We are currently working with pet apparel and accessories designer Chi WOW WOW on a few ideas for charity charms, where proceeds will go to the breed specific rescues. One of the designs for the charms has Porky’s face on it. We are playing around with the saying on it. What do you think is a cool Pug saying or motto? A HUGE THANK YOU to everyone who contributed and got the word out! With your help, PugHearts was able to raise the $2K, which will go towards providing medical treatment for the current rescued Pugs. Please visit them at www.PugHearts.com for updates. These poor Puggies…I need to do something. And this is why we all Adore Le Pug. I want to thank everyone who open their hearts and contributed to PugHearts.org and all the rescue Pugs. It’s so hard for me to write right now. I am still in shock and saddened by the email I just received. Richard (PugHearts.com), Lilly’s foster parents, just emailed me…Lilly passed away tonight at 9:25CST. Lilly has crossed the rainbow bridge and is now in a better place, where she will no longer suffer. She was in great care in her final hours. For anyone reading this, especially if you are owned by Pugs, don’t wait till it’s too late to do something. PLEASE do something now and help before it’s too late. Animals who have been neglected and abused deserve a second chance and a forever home. Lilly is currently under the care of Houston Pug Hearts Houston Pug Rescue. She has huge tumore cells all over. Poor thing. I am filled with sadness and chills through my body every time I look at these pictures. They need $2000 for her treatment and only have received $65 of contribution as of today. 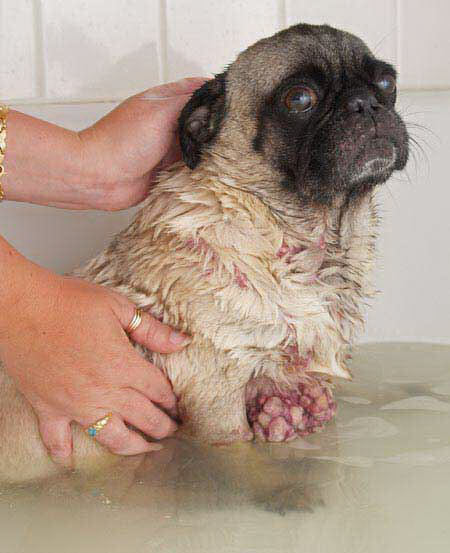 Please visit www.pughearts.org and help Lilly! (SERIOUSLY, EVERYTIME I LOOK AT THESE PICTURES, I GET CHILLS AND ALL MY THE HAIR ON MY BODY STAND UP…I can’t help but wonder how this could of happen to this sweet Pug and we all can help by chipping in whatever we can). 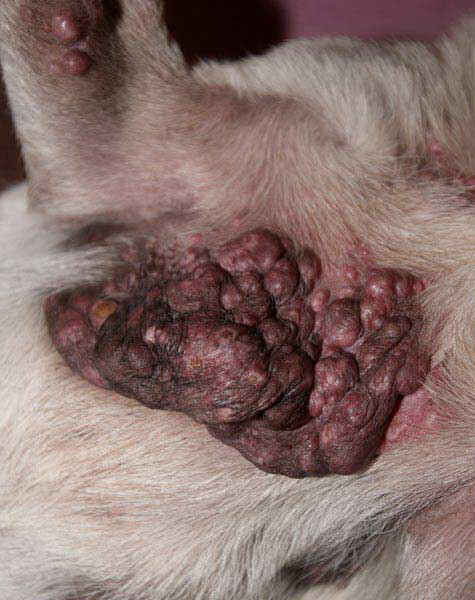 PS – We just learned that this was caused by neglect of her previous owner and she has stage 1 cancer. It’s not terminal at this point so please chip in. Every dollar will help! Thank you and Pug kisses. Since we have had some computer problems in the last week, we have accumulated some pictures. I decided to just move forward since well, we have a gigantic library of photos (I am crazy and have a camera strapped to me at all times). Last weekend, Houston had a huge Dog Show at the Reliant Center. This is the largest show we have here at least. We wanted to stay longer and support Pug Hearts but it was a busy weekend and we were only able to stay for an hour. Pug Hearts, THE Houston Pug Rescue was there and had a beautiful booth with lots of pictures of rescued Pugs. Pork & Brown had a ball of fun. We saw this huge poodle at the grooming contest area…she looked like a scary warrior. We met another Mastiff on the way out but the boys were not too interested…no flat face, we are not interested! Awe…at last, they met two other Puggies (shown below) and were in love! They sniffed and sniffed…both sets of Pugs really liked the other. Hope they come to our Pug Meetup! Here’s some cute group photos (this is the best group photo we could get since the little guys were running around like crazy pigs…I mean pugs). More PugNic photos on the Flickr Recent Photos on the left. This is what true love is all about…I felt the love from the Pugs and the mutual joy of Pug and parent…being owned by Pugs is wonderful! Kritter is wondering where his Brother Rascal and Sister Peekaboo went…Peekaboo is right behind you Kritter. Peekaboo is one of the cutest dogs we have ever seen…we love Frenchies! We will miss our friends Kritter, Rascal, and Peekaboo from flatnosedpups since they are moving to Austin. We were able to catch up and hang out at the PugNic event hosted by <a href=”http://www.pughearts.com”>Pug Hearts Houston Pug Rescue</a>. It was so fun to dress everyone up and match…Kritter and Porky have similar body types, we kept getting them confused. Pugs and Frenchies make the best herd! And every picture is adorable and precious! It’s been a while since I posted some pictures since work has been crazy. I finally downloaded this software by Picture Resize Genius and it’s fantastic! You can download the trial version and try it yourself. It does batch photo resizing and other minor edit stuff. It saves a lot of time because I had 262 pictures from the Pug Meetup earlier in the month and the PugNic event hosted by Pug Hearts Houston Pug Rescue. I will batch load onto Flickr tonight so that will be available for your viewing pleasure. As for the post, I will be posting throughout weekend and split it up since there are just way too many cute pictures and they all deserve to be viewed! Here is Porky showing off his new Bristish Punk Kilt and Skull Tank by Chi WOW WOW. Chi WOW WOW is one of our favorite pet clothing designers because we love vintage style and everything is made for boys (girls can wear it too). It’s like vintage D&G meets Diesel, with a pinch of Miss Sixty! A lot of the stuff is one of a kind, so there is only 1 of each style. Check out the cool, hip vintage fashions from Chi WOW WOW!